Need to Know blew past its initial $20,000 goal in a few days, and it’s now more than doubled that. 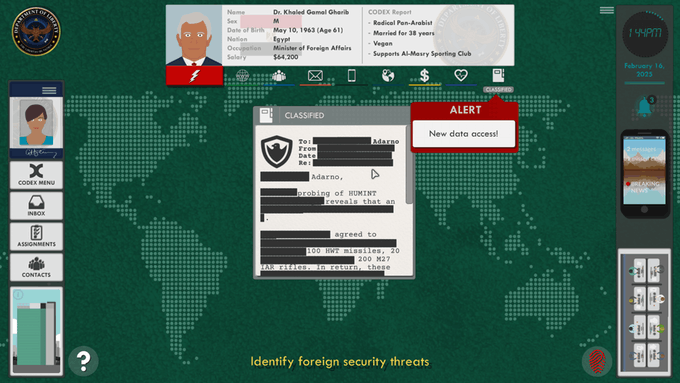 It’s a political thriller; a simulator influenced by Papers, Please and molded after the real world NSA. As you can guess, it’s a very political game. Given it’s rapid success, it shows that people want more political games, but there aren’t many out there. Most videogames shy away from talking about politics. Developers from across several nations toil away at making their games as apolitical as possible. As with any rule, there are always a few exceptions. Hideo Kojima almost goes out of his way to make Metal Gear as political as possible. But for every Metal Gear, there are at least five Fallout’s or Assassin’s Creed’s that are perfect for political commentary, yet almost devoid of it. To carry on with the Fallout example, yes its main message is “nuclear war is bad,” which is true. Nuclear war would put a damper on anyone’s day. But the franchise groups all of mankind under the “I <3 Nukes” umbrella and chastise us all, rather than directly address the politicians who were and are responsible for nuclear weapons in the first place. In that sense, politics play a passive role to the specific narrative of each game. And Fallout is far from the only example. Other games like Call of Duty and it’s many clones dance around American militarism with the expertise of a world class ballerina. It’s there, and it always will be as long as developers aim for a realistic setting. But the developers and publishers pretend like it’s not, focusing on big explosions and gunning down hundreds of people without ever allowing the player a moment to stop and ask themselves “why?” They don’t realize their silence on the issues in the franchise speaks volumes. Need to Know is not like those games. It’s built from the ground up as a political statement, critiquing a specific group of people: the NSA and its supporters. It’s made explicitly clear on the Kickstarter page. A direct quote from the campaign reads “it [Need to Know] critiques the system by passing the uncomfortable (or too comfortable?) mantle of power onto your shoulders, and testing which choices you’ll make.” Monomyth Games will not shy away from their resentment of a world full of governments spying on their own citizens. Reading the Kickstarter page, it’s clear that Monomyth is making a game that is a total indictment of the NSA. 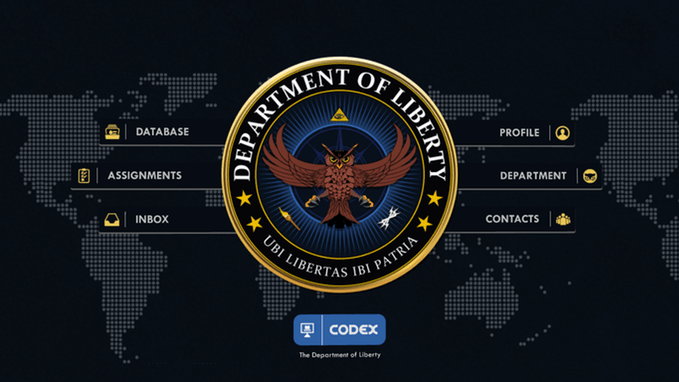 They specifically mention the NSA regarding the Department of Liberty, the game’s fictionalized version of the agency. “Join the DoL as an idealistic, but broke, graduate,” the description says. “You hate it […] and intend to leave as soon as you can.” Putting the player in the shoes of someone who hates the DoL is interesting, and says a lot about where the developers are coming from. Further on, you’re asked if you plan to “stick to your principles and defend people’s privacy, or succumb to the allure of absolute power?” No attempt is made to appear even-handed, no middle ground is sought. You’re a bad person if you invade other people’s privacy, and a good person if you don’t. Things get even more one sided by the Department of Justice itself. It’s described as a tool of the government used to “ruthlessly silence its opponents.” References are made to 9/11, and any remaining vagueness of this being a fictional world is thrown out in the following paragraph with a mention of Washington D.C. Despite all this, screenshots show the game to be fairly balanced. Along with silencing critics and spying on citizens, you will also be tasked with stopping criminals and investigating corruption charges. The player will also have to worry about getting fired or evicted from their home, and being completely broke, it can feel like a death sentence. Just reading the Kickstarter page, it’d be easy to get the impression that Need to Know is too heavy-handed and one sided. Monomyth Games choosing to represent their game in such a light could be seen as a disservice, and you might disagree with the message the game is promoting, but you have to at least admire the sheer audacity of it. In a medium that’s so afraid to even suggest a political leaning, Monomyth is already positioning itself on a new stage created by other indie developers, and in part, Kickstarter. Kickstarter is good for more than bringing back dead genre’s or retro games, it’s a breeding ground for new ideas and influences. One of those influences is politics. Need to Know is not the first, and likely not the last politically driven game on Kickstarter. Before it there was Republique, which had a similar message. This is the Police explored the image of America’s police force. Each of these games are heavily influenced by politics. Invisibility Blues, while a video series, examined race in gaming. While they might not be the driving force behind it’s mechanics like with Need to Know, the developers weren’t shy about wearing that political influence on their sleeves. Thanks to these Kickstarted political games, videogames are no longer a quagmire to be argued about by ignorant politicians and lawyers. Instead, the medium can grow its own political voice, and wield it with the same power as films and novels.